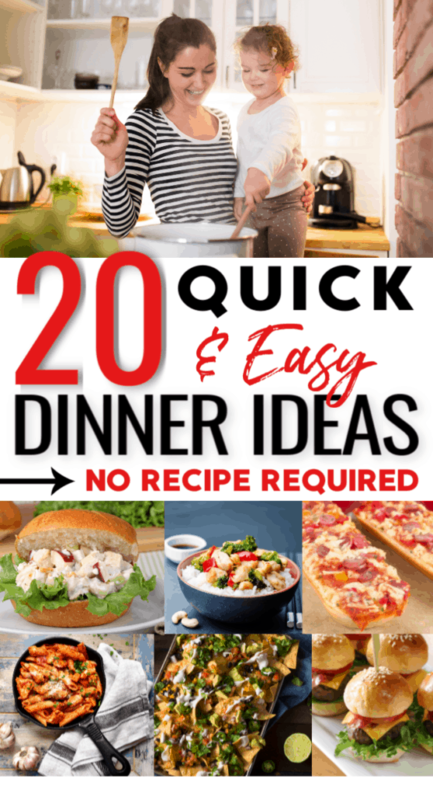 20 Quick Dinner Ideas: Homemade + No Recipe Required! Need quick dinner ideas for tonight? Or maybe you’re meal planning and you want some easy recipes to fall back on during busy weeknights. As much as I enjoy cooking, I totally understand the need for simple, no-fuss family dinner ideas. Cooking is NOT fun when it is too complicated, time-consuming or just doesn’t fit into your family’s schedule. Even when I’m relying on simple dishes, I want them to be healthy-ish and homemade; filling; and fairly quick to prepare and clean up afterwards. Each of our four kids has different meal preferences (as in – some are pickier than others). Because of this, I usually only try 1 to 2 new recipes each week. Besides a few new recipes, I generally rely on simple tried and true recipes, crockpot meals or easy, no-recipe-needed meals like the ones I’m sharing today. I call them “no-recipe” because they’re very basic: you can pretty much glance at this list and be able to make them without detailed instructions. You don’t necessarily need to measure exact quantities of ingredients either. However, if you’d like to have a quick reference for these meal ideas, there is a printable version available at the end of this post. Another great thing about these quick dinner ideas is that you can completely customize them for your family’s size, and with your family’s preferences in mind. 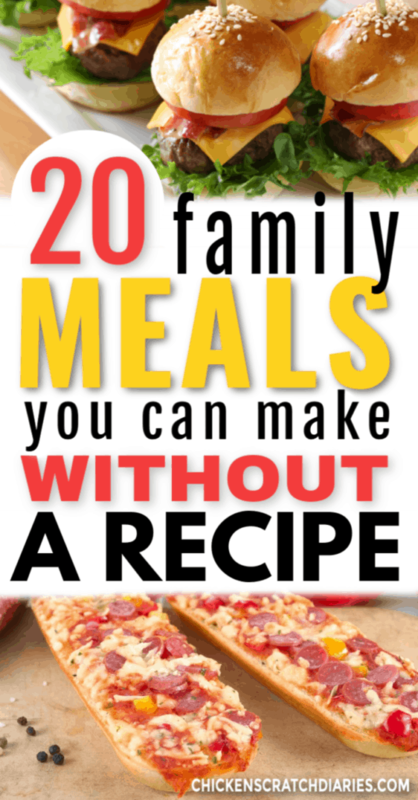 Here are 20 meals that our family loves and I hope yours does too! It’s super simple: Buy 1-2 loaves of french bread from the bakery section of the grocery store; cut it in half lengthwise. 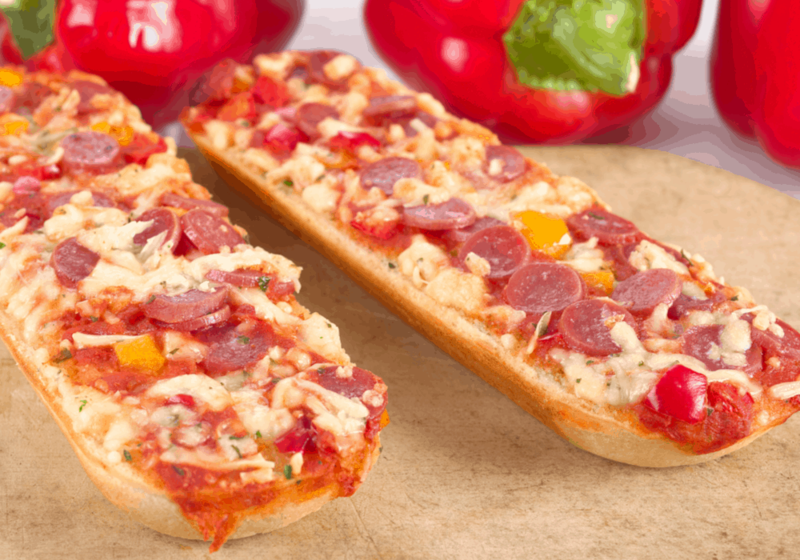 You can either add toppings to the two long pieces or cut into smaller sections and top them individually. Simply add marinara sauce, mozzarella cheese and your choice of pizza toppings such as: pepperoni, sausage, beef, chicken, bacon, ham, peppers, onions, pineapple, olives, tomatoes, mushrooms, spinach. Bake approximately 8 minutes at 350 degrees. I love to bake potatoes in the microwave. For our family, I take 6 russet potatoes, wash and dry and arrange them in a glass pie plate. Then I drizzle about 2 teaspoons of olive oil and rub all over the potatoes (it keeps the potatoes moist). Sprinkle with salt. (Sea salt is great if you have it). Microwave using your baked potato setting or until done, turning over halfway through. For 6 potatoes it usually takes at least 15 minutes total, depending on size of potatoes. Split baked potatoes in half and top with butter and your favorite toppings such as bacon, crumbled sausage, shredded cheddar, onions, sour cream. Chop diced veggies and meats of your choice – a few handfuls of each. Ideas: ham, cooked/chopped bacon, shredded cheddar or monterrey jack cheese, onions, bell peppers, tomatoes, mushrooms. Heat a large nonstick skillet on low-medium heat and melt 2-3 tablespoons of butter. Beat together approximately 6 eggs per omelet, along with about 5 tablespoons of milk (this size omelet serves about 3 people in our family). Pour just the egg mixture into the preheated skillet. Once mixture is firm when lifted with a spatula on one corner, add the toppings onto one-half of the skillet; then fold half the eggs over the toppings onto the other half of the skillet. You can then cut the omelet in half or thirds for easier turning, and turn each section once more until eggs are cooked through (no longer runny). Preheat skillet on medium-low heat. Add a few teaspoons of vegetable or olive oil. Chop grilled chicken, bell peppers, onions or other preferred vegetables. Add a tortilla to skillet (any size you prefer); top with shredded cheddar, desired meat/veggie filling, more cheese, and second tortilla. Cook approximately 2-3 minutes on each side until crisp. Slice into pizza wedges and serve with salsa. Prepare up to 6 stuffed bell peppers by coring and seeding them and removing the tops. Stand them up in a greased baking dish side by side. Preheat oven to 350 degrees. In a skillet, brown 1/2 pound of ground beef or sausage and 1/2 cup diced onion and some minced garlic. Make 1-2 cups of instant rice (I use instant brown rice). Mix together the rice, cooked meat and onion and add chili powder, garlic powder, salt, pepper and cumin to taste. Add approximately 1 cup salsa and mix. Cut up a large block of cheddar cheese into small cubes. Add a few cubes to the bottom of each pepper; add rice/meat mixture then top with a few more cheese cubes. Bake at 350 for approximately 30 minutes, until cheese is melted and peppers have a slightly roasted appearance (or to desired doneness). Cook 1/2 to 1 pound of ground beef or sausage; crumble and stir in a jar of preferred brand spaghetti sauce. 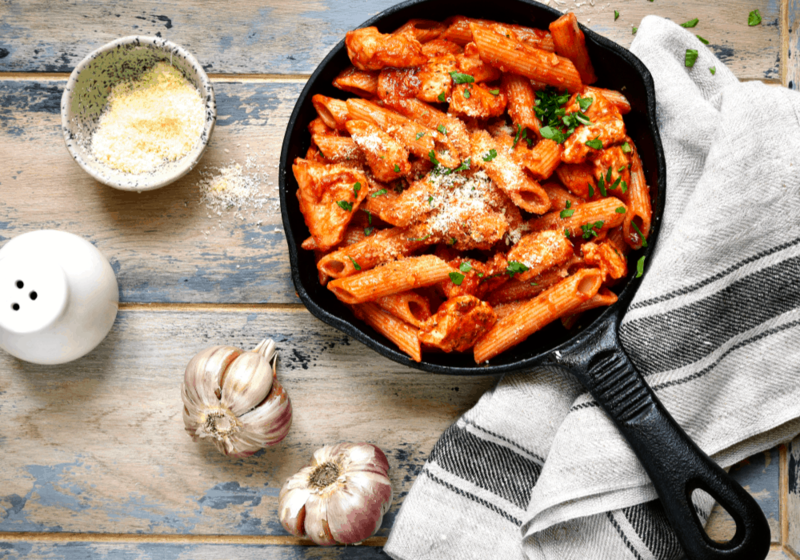 Cook spaghetti noodles according to directions – or your favorite pasta: ziti, penne, rigatoni, etc. Top with meat sauce. If desired, top with mozzarella and/or Parmesan cheese at the end. *If you have a spiralizer, zoodles (curly zuchinni “noodles”) are a fun and healthy alternative to pasta. Alternatively, you can add shredded zucchini to spaghetti sauce to bulk up the nutritional value. Layer your favorite lunch meats and cheeses on your sandwich. Dip entire sandwich in an egg and milk mixture (as when making french toast). Cook in preheated skillet until browned on both sides. Dip in your favorite jam, or ranch dressing. Serve with sliced veggies such as carrots, celery or cucumber. Cook 1 box of garden rotini pasta according to package directions; rinse in cold water and drain. Add to a large bowl, along with: chopped cooked chicken, sliced cherry tomatoes, cheddar cheese cubes, green onions, diced bell peppers and sliced olives. Toss with approximately 1/2 bottle of zesty Italian dressing. Serve cold. Grill approximately 3 chicken breasts or approximately 6-8 chicken tenders in saute pan until done. Season with salt and pepper. Let cool, then chop. 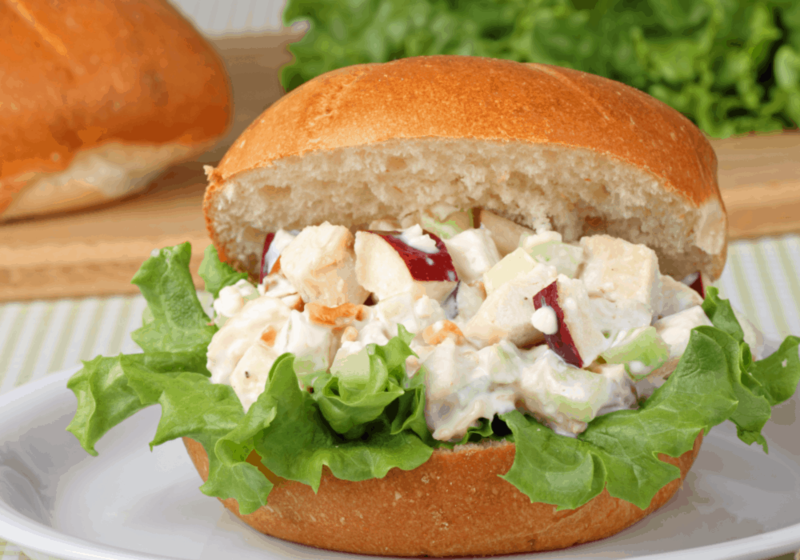 Fruit version: Add to chicken: chopped apples, celery, grapes, walnuts and add mayo to desired consistency. Savory version: Add to chicken: chopped celery, dill or sweet pickles, red onion, salt and pepper and add mayo to desired consistency. Serve on sandwich bread, hoagie rolls or croissants. Preheat a cast iron skillet to medium heat and add enough vegetable oil to make a depth of about 1 inch in the skillet. Cut approximately 1 pound of chicken tenders into nugget-size pieces. Pat dry. Mix together about 1.5 cups of flour, 1 tsp paprika, 1 tsp salt and 1/2 tsp pepper. In separate bowl, whisk together 1 egg, 1 cup milk and 1 tsp baking powder. Dip chicken in flour mixture, then egg mixture, then flour again. Cook approximately 6 minutes until lightly browned on all sides. Serve with sliced fruit such as apples, pears, grapes or peaches. Using the large burrito size flour tortillas, layer in the center of each tortilla: refried beans, cooked rice seasoned with salt, ginger and lime juice (to taste); cooked ground beef or shredded chicken seasoned with chili powder and cumin (about a tsp of each, to taste) and salt and pepper. Slice a block of cheddar or colby jack cheese into cheese “sticks” and place 1 stick in center of each burrito. Fold up burrito-style (see this tutorial if you need help!). Brush liberally with vegetable oil and bake on a cookie sheet at 350 for approximately 25 minutes or until lightly browned and crispy. Serve with salsa. This one hardly needs explanation! 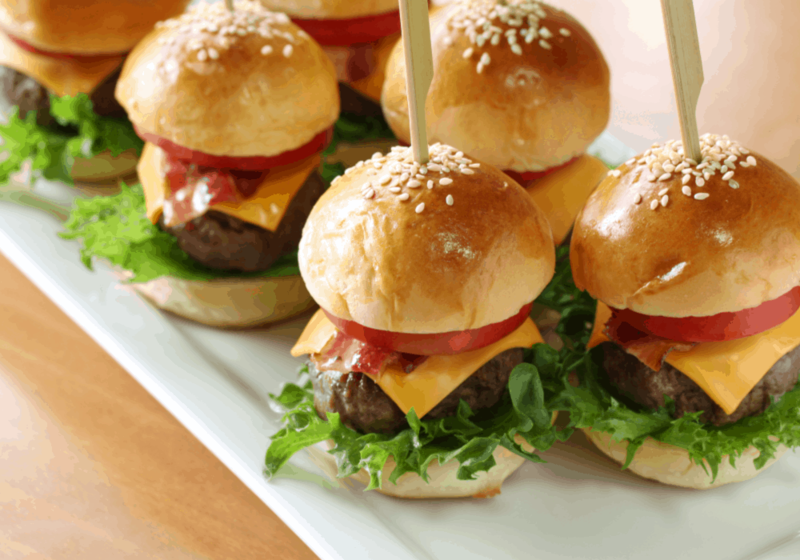 Make miniature versions of your favorite hamburgers and serve on slider buns, Hawaiian rolls or any dinner rolls will do. We like to season our hamburgers with Montreal steak seasoning. My husband and I like to top with blue cheese in between 2 slider patties. If you really want to get creative, create a “slider bar” with lots of toppings to choose from. Mix together in a small bowl: 2 tablespoons olive oil; a teaspoon of lemon zest and a teaspoon of orange zest; approximately 2 tablespoons each of the juice from the lemon and orange; 2 tablespoons of honey; dash of salt and pepper. Drizzle over everything in the pan and toss the veggies a bit to coat. Bake at 400 approximately 25 minutes. If desired, you can add some bell pepper slices, onions or green beans at this point. Turn oven up to 450 and bake another 10 minutes or until veggies are slightly browned and tender. Another no-brainer recipe: add bacon, lettuce and tomato to toasted bread OR try my homemade sandwich bread recipe the day before (it’s not quick but it’s delicious!). You can also add in or substitute lunchmeat, avocado, pickles, banana peppers, etc. Cook a package of frozen stir-fry veggies on medium-high heat in a few tablespoons of olive oil for about 10 minutes or until crispy-tender. Add 1-2 tsp garlic and cook another minute. Add in cooked, chopped meat such as chicken or skirt steak; 1 small can of pineapple tidbits and toss with desired amount of soy sauce and a few teaspoons of brown sugar. Add more olive oil if necessary, toss until coated. 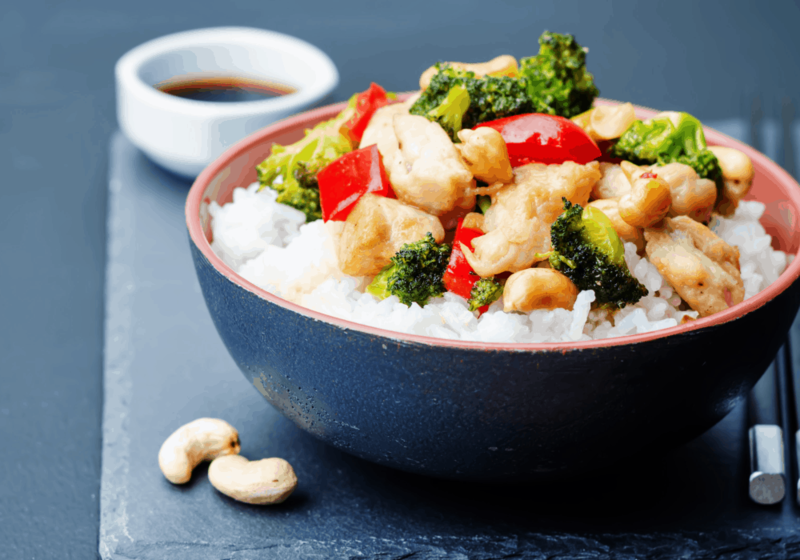 Serve with cooked brown rice or lo mein noodles (I like these that only need heated– already cooked!). Preheat skillet with a few tablespoons of vegetable oil. Dice potatoes, bell peppers, green onions, zucchini. Fry potatoes and onions on medium heat in cast iron skillet for about 8-10 minutes, then add rest of vegetables and cook until tender-crisp, along 1/2 can of corn (if desired) and a teaspoon of garlic (minced/jarred garlic works great). Stir in crumbled cooked sausage or bacon. Near the end of cooking you can add an egg or two, stir in and cook through. Top with shredded cheese and remove from heat. Serve with toast. Spread tortilla chips on a pizza pan. Cook 1/2 lb ground beef or about 3 boneless chicken breasts and shred. Return to stove and add a little water (about 1/4 cup), a teaspoon of chili powder, teaspoon of cumin and salt and pepper, all to taste. Layer refried beans, then the seasoned meat; rinsed and drained black OR pinto beans, top with shredded cheese. 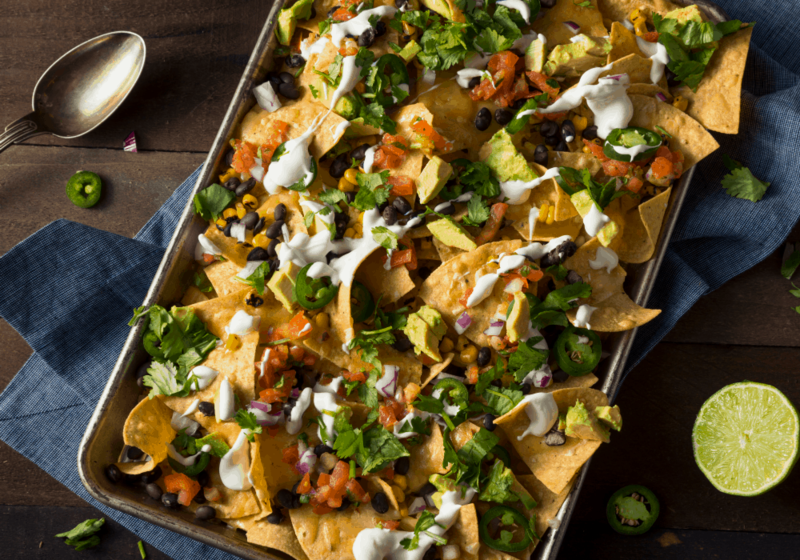 Bake at 400 about 7 minutes or until cheese is melted and top with : heated queso dip (from a jar), shredded lettuce, diced tomatoes, green onions, avocados, olives, sour cream – any toppings you prefer. Brown 1 pound ground beef and 1 small diced onion; add 2 teaspoons of curry power, 1/2 tsp cinnamon, 1/2 cup bread crumbs and 1/2 cup beef broth, stir and simmer just a few minutes. Press together 2 crescent roll triangles to make a rectangle. Using 2 cans, make 8 rectangles total. Lay out 4 rectangles on 1 cookie sheet and 4 on a second one. Add filling to one side of each rectangle (divide evenly between 8 pockets) and then fold over into a square and pinch the seams. Bake at 400 degrees for about 15 minutes. We like to use sour cream or raspberry jalapeno jelly as a dipping sauce. You could also use plain Greek yogurt. Serve with steamed broccoli or carrots, or a side salad. You can make your own meatballs or buy them frozen, whichever you prefer. Cook meatballs through; then place 3 meatballs on each hotdog bun- however many needed to serve your family. Top with marinara sauce and mozarella cheese; bake at 350 approximately 8 minutes until cheese is melted. Half chicken breasts lengthwise; season with salt and pepper and grill in a non-stick skillet until done. Butter hamburger buns and toast in the oven at 350 degrees about 5 minutes until crispy. Garnish sandwiches with lettuce and tomato. Top with condiments or red pepper spread: Dice a few jarred roasted red peppers, mix with a few tablespoons of whipped cream cheese and a dash of dried dill. Serve with sweet potato fries or potato chips. 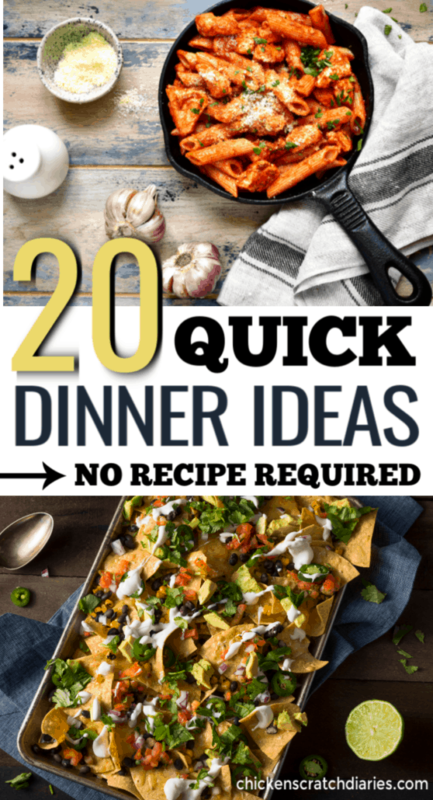 There you have it – 20 of my go-to family dinner ideas. Easy doesn’t have to mean convenience foods, when you can whip these up in no time! Best of all, these simple dinners will give you more time to spend with your family outside the kitchen. If you would like the printer-friendly version of these recipes, simply sign up for my newsletter below! I’ll send you the 10-page printable along with access to my entire freebie library. I just sent you an email Stephanie!